First position in the initial phase group the only option in order to advance to the main draw, on Friday 6th October the top four seeds in the Junior Boys’ Team event at the 2017 Serbia Junior and Cadet Open in Belgrade all reserved penultimate round places. The top seeded combination of Canada’s Jeremy Hazin, who lined up alongside the United States duo of Gal Alguetti and Sharon Alguetti endured few problems, just one individual match was surrendered; that being against the team form by the host nation’s Vladimir Jovicic and Alan Jasarovic who allied with Montenegro’s Filip Radovic. Even more impressive, the third seeded Indian combination of Manav Vikash Thakkar, Manush Utpalbhai Shah and Ishaan Hingorani afforded no charity; they recorded three-nil wins in every contest. 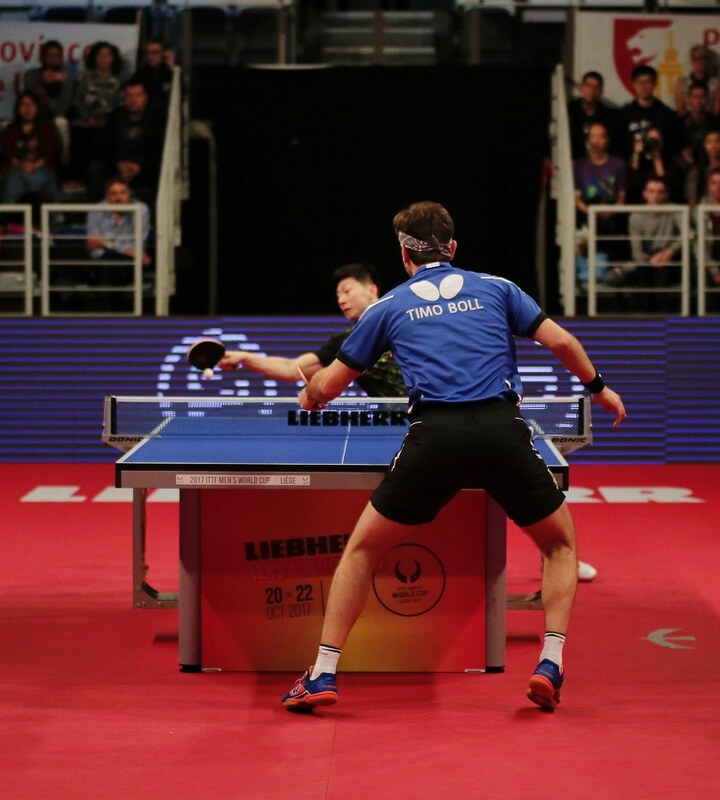 However, for the Portuguese combination of José Pedro Francisco, Samuel da Silva and Tiago Li, the second seeds, as well as for the outfit formed by Ireland’s Owen Cathcart, Romania’s Paul Mladin and Sweden’s Melker Nilsson life was more testing. The Portuguese outfit was required to perform a recovery of note when facing the Serbia ‘A’ Team trio of Pero Tepic, Dimitrije Levajac and Matija Jovicic. They trailed by two matches to nil after José Pedro Francisco had lost to Pero Tepic (11-6, 7-11, 11-4, 11-8) and Vitor Amorin had been beaten by Dimitrije Levajac (6-11, 14-12, 9-11, 11-8, 11-2). It was at that stage the recovery began. Tiago Li accounted for Matija Jovicic (9-11, 11-9, 11-8, 11-4), before by the very narrowest of margins José Pedro Francisco overcame Dimitrije Levajac (11-9, 5-11, 11-4, 1-11, 14-12). Thus, he set the scene for Vitor Amorin to complete the fightback, his colleague duly obliged, he beat Pero Tepic in three straight games (15-13, 11-3, 11-7). A testing encounter it was the same for Owen Cathcart and Paul Mladin, the absence of Melker Nilsson made life exacting. Bulgaria who named Martin Petrov, Stefan Todorov and Ivan Radkev in the line-up proved challenging opponents. Wins for Paul Mladin over Martin Petrov (11-3, 7-11, 11-3, 11-5) and in opposition Stefan Todorov (11-8, 11-8, 12-10) proved the backbone of victory, Owen Cathcart proved the hero. The overall score in the fixture level at two matches apiece, he accounted for Martin Petrov in three straight games (11-6, 11-4, 12-10). Likewise, in the Cadet Boys’ Team event, only first place in each of the five groups ensured a main draw place. Croatia ‘A’ represented by Ivor Ban and Filip Borovnjak secured first place in their group as did the Czech Republic ‘B’ Team duo formed by Matej Stach and Simon Belik. Likewise it was top spot for the Spanish combination of Arnau Pons, Norbert Tauler and Iker Gonzalez; an achievement also realised by the Portuguese trio comprising Ricardo Correia, João Silva and David Bessa. Meanwhile, in the one remaining group, top spot was secured by the Croatia ‘C’ Team pairing of Bruno Petek and Leo Vekic. Croatia ‘A’, the Czech Republic ‘B’ and Spain progressed directly to the semi-finals; in the one quarter-final contest, Portugal beat Croatia ‘C’ by three matches to one. Play in the Junior Boys’ Team and Cadet Boys’ Team events conclude on Saturday 7th October.